An exciting texture pattern washes over these textured love knot earrings in 14K two-tone gold from Apples of Gold Jewelry! 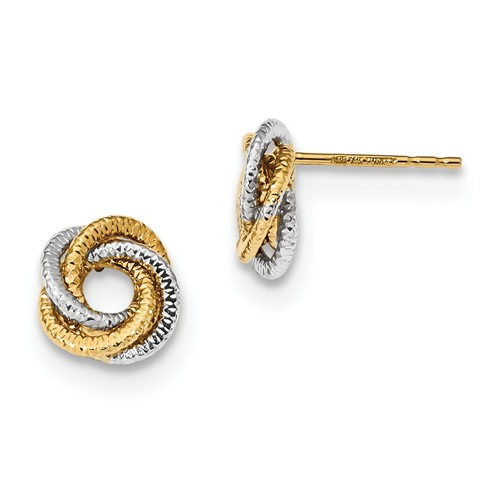 Not only do these earrings have a coiled rope like texture to them, making them stylish and exciting, they also feature a two-tone gold look. The 14K white gold and 14K yellow gold combine together to make a playful and elegant earring that you will want to wear every day! These earrings have a yellow gold post, with a push back design closure. We guarantee our Textured LoveKnot Earrings, 14K Two-Tone Gold to be high quality, authentic jewelry, as described above.